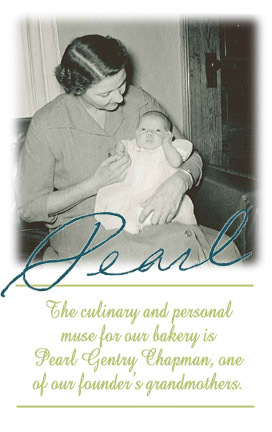 Pearl was born in November of 1911 outside of Charlottesville, Virginia. She was the youngest daughter of ten children and had a twin brother. She was married to Nathaniel Aljourn Chapman for 56 years. They had two sons, followed by four grandchildren – two girls and two boys. She spoiled all of her grandchildren equally. She took them fishing and on picnics. She built their forts and club houses, and always had homemade snacks when they arrived from school. She nursed the flu and the mumps, patched skinned knees, wiped tears, healed sick kittens, helped with homework, and always had an ear to listen. She made doll clothes, played baseball, and kept the Monopoly board out all summer for long continuous games. Pearl cooked everything from scratch, using home grown ingredients and hosted large Sunday dinners with as many as four or five desserts. She invented our Orange Blossoms, which are a favorite treat of her grandchildren to this today. Through her scrumptious recipes and nurturing spirit, she continues to inspire her family and friends, and remind us of the enduring comfort of love – and lots of butter and sugar.